Dialog TV introducing new postpaid package with budget monthly rental the named "Power PLUS". Dialog TV Power PLUS postpaid Package facilitate 50 channels for Rs 549.00 a month. 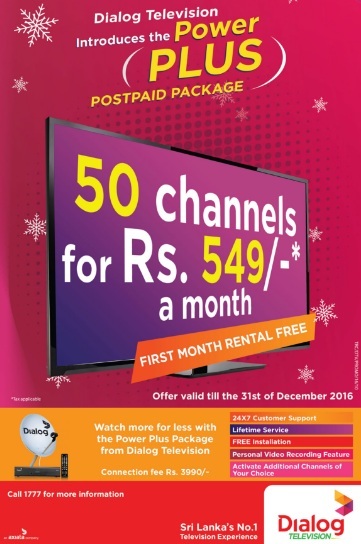 First month monthly rental free for the new Dialog TV Power PLUS Package and offer valid till the 31st of December 2016. Dialog TV offer 24x7 customer support, lifetime service, Free installation, personal video recording feature and activate additional channels in your choice. Watch more for less with the power plus package from Dialog television. Call 1777 for more information.